You can substitute fresh peaches for the mangoes in this recipe. Or, if you can find them, use the traditional English ingredient: fresh gooseberries. 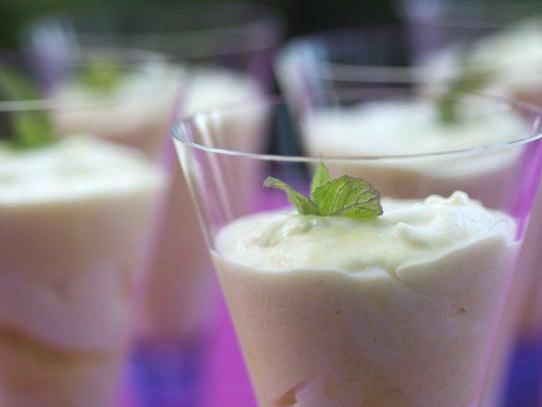 Read more about no-bake summertime desserts in Keri Fisher's article "Chill out." In a large bowl, combine the mango purée, honey, 2 to 4 tablespoons sugar, lime juice, and yogurt, and stir until smooth. Whip the cream and remaining 2 tablespoons sugar until stiff peaks form, then gently fold the cream into the mango. Spoon into parfait glasses and refrigerate until set, at least 2 hours. A food processor works well for puréeing the fruit. Culinate editor's note: Unless you have very sweet gooseberries good for eating out of hand, you'll need to turn fresh gooseberries into a sweetened purée. Slice the tops and tails off the berries and halve the berries lengthwise, then cook them down with a little sugar for about 20 minutes. Chill the purée before folding it into the whipped cream for the classic English dessert mentioned in the introduction: gooseberry fool.